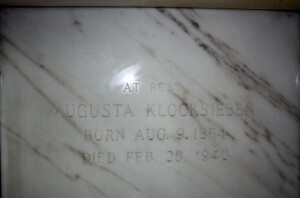 Daughter of: Friedrich Zimmerman and Johanne Stimm, who immigrated April 30, 1874. 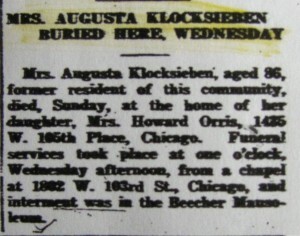 Wife of William Klocksieben, married December 6, 1874, Lutheran church at Sollitt, IL. 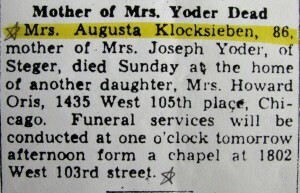 Mrs. Augusta Klocksieben, 86, mother of Sophie, Mrs. Joseph Yoder, of Steger, died Sunday at the home of another daughter, Minnie, Mrs. Howard Orris, 1435 West 105th Place, Chicago. 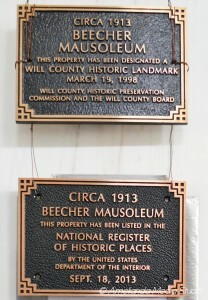 Funeral services will be conducted at one o’clock tomorrow afternoon from a chapel at 1802 West 103rd Street.